The Round meets every Thursday during full term between 8 pm and 10pm in Wesley Church Hall, Cambridge, England (by the Jesus Lane Roundabout on King Street), after which we will often retire to the pub. Visitors and those with no University affiliation are very welcome to come along. No experience is necessary — all dances are walked through and explained, though student-level fitness and ability to pick things up tends to be assumed. You don’t need to bring a partner — other people there will be ready to dance with you. We usually dance to recorded music at the weekly meetings, but two or three times a term we have a live band. The last meeting of the term is a party, when we normally have a live band, and people bring finger food for the break in the middle. 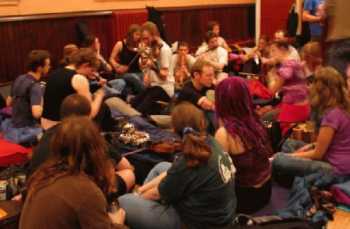 The Round organises ceilidhs, normally twice a term on Fridays or Saturdays. They’re always popular. Sometimes we dance to local talent, and sometimes we bring in top outside bands. We provide a caller to explain all the dances, and some of our callers are now in high demand on the national English ceilidh scene! 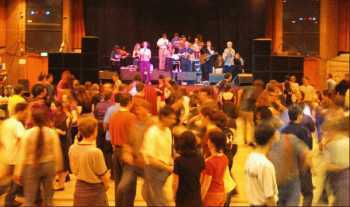 Most of the ceilidhs are at Emmanuel URC which is opposite Pembroke College, on Trumpington Street. 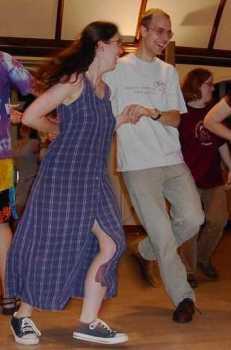 The exception is the May week ceilidh, which is held in Emmanuel College Old Library. At the end of the Easter Term, the Round holds its Playford Ball, and invites past and present members of the Round to attend. It is a more formal event than our regular meetings, with a visiting band. The dances are mostly from the Playford era — late 17th and early 18th century — but with a few modern dances in a similar style. 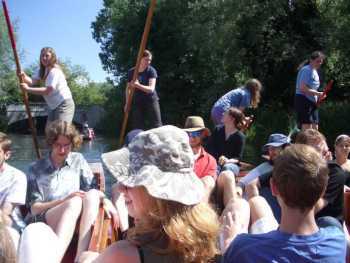 On the Sunday following the annual Playford Ball there is the customary punt party to Granchester Meadows. Details will be announced nearer the day. From time to time the Round holds a Jane Austen evening, when we meet for Formal Hall dinner at Emmanuel College and a dance afterwards in Emmanuel’s Old Library. Jane Austen loved dancing, although she only ever mentioned one dance by name in her novels. We aim to do a programme of dances from the late 18th and early 19th century that she might have danced herself. They are not for the most part the dances that you may have seen in the films and TV series, which are usually dances from 100 years or more earlier, and would have been quite out of fashion by her time. IVFDF (iv-diff) is the Inter-Varsity Folk Dance Festival, the country’s big annual student folk dance festival, The weekend is a frenzy of ceilidhs, workshops, dances, displays, sessions, more ceilidhs and late-night merriment. It is an unparalleled experience. In 2017 it was in Cambridge, 2018 was at Sheffield and 2019 will be at Edinburgh.